The 385m-high Capital Market Authority tower will be the centrepiece of the King Abdullah Financial District. Image courtesy of Lerch Bates. The skyscraper will feature a crystalline facade resembling the crystals found in the country’s wadis. Image courtesy of HOK. Construction of the tower began in 2010 with completion scheduled for 2017. Image courtesy of Sweett Group. Capital Market Authority Tower is a 385m-high skyscraper being built in the King Abdullah Financial District, Riyadh, Saudi Arabia. HOK and Omrania designed the tower for Al Raidah Investment Company. Located north of downtown Riyadh, the tower will be built on an area of 200,000m². Construction on the skyscraper began in 2010, and it is scheduled to be completed by mid-2017. The building will be the headquarters for the country’s capital market-regulating body, and the tallest building in the financial district. Designed to be one of the world’s most high-tech skyscrapers, the tower is being developed at an estimated cost of SR3bn ($799m). It is designed to meet LEED Gold certification requirements. 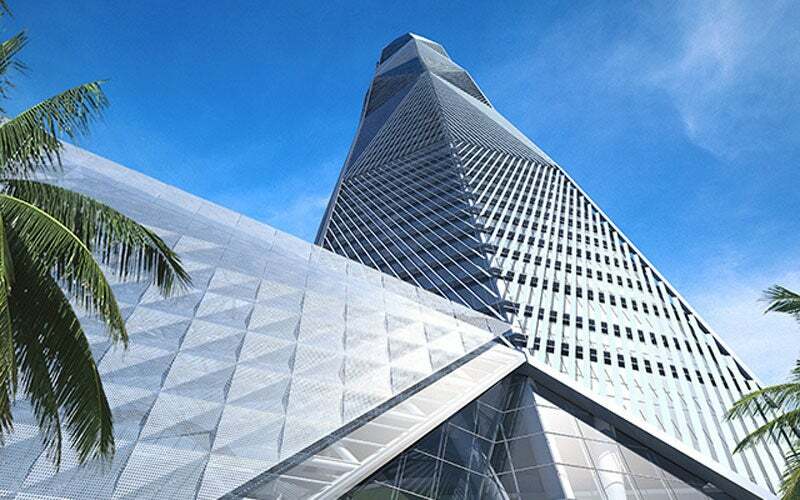 The tower is designed in a trapezoid shape, and its floor plates will allow flexibility, resulting in the tower tapering inwards and outwards as it rises. The floor levels are organised around a Y-shaped core, which incorporates the vertical transportation, building services and emergency egress stairs. The tower’s body is organised into low-rise, mid-rise and high-rise sections that serve as a module for a variety of building services and systems. The building podium is designed to resemble a fallen gemstone that gently rests against the tower, while integrating public circulation and private amenity spaces. The interiors of the public spaces integrate with the architecture to support a single aesthetic design. A rich palette of materials featuring neutral shades of gray is used to bring warmth and elegance to indoor spaces. The first signature building at King Abdullah Financial District, the CMA tower will offer innovative facade lighting and access systems. The building’s geometry will contribute to a highly functional, original structure in Riyadh’s skyline. The skyscraper’s crystalline facade will resemble the crystals found in wadis in the Saudi Arabian desert. Its diamond shape will also allow natural light into the building. High-performance, triple-glazed glass will cover the building’s exterior, which is further shaded by a shroud. The 80-storey tower will have four basement levels, which will be used for parking and back-of-house functions. The entry level podium at the base will include a 450-seat, two-tier auditorium, a 220-seat cafeteria, restaurants, and a two-storey atrium. The tower will also feature a swimming pool on the 54th level, as well as corporate and commercial office space. Each floor will have a horizontal gantry or catwalk. A 22m-tall atrium will link the pedestrian entrance from the financial plaza to the motor drop-off zone on the north access road. It will also serve as a path for movement into the lobby situated on the east, as well as support functions in the freestanding podium on the west. Bridges will also be constructed across the atrium to connect the upper levels of the lobby with the cafeteria. 300,000m² of floor space in the tower’s top section will be occupied by the Capital Market Authority, while the remaining space will be leased for commercial purposes. Promoting an innovative vertical transportation system, the tower will have one of the world’s biggest twin-elevator installations with double-deck shuttles. The twin-elevator system will allow access to the two double-deck sky lobbies. The elevators will be placed in the same shaft but function independently, allowing more people to use them. The tower will include 11 double-deck shuttle cars, 17 twin elevators, 12 normal elevators, and 12 escalators. "Construction on the skyscraper began in 2010, and it is scheduled to be completed by mid-2017." A high-performance, solar-control system will be installed in the tower to moderate light and heat. An external layer of fins, gantries, photovoltaic solar and perforated panels will also provide shade, as well as enhance the thermal efficiency of the triple pane glazing. The triple-glazed façade will be filled with an aerogel to provide thermal insulation. The tower will have an energy-efficient skin to reclaim energy through a photovoltaic array installation on the roof. It will also be equipped with an intelligent infrastructure, including wireless communication, air-blown fibre optics, and converged networks. Structural engineering is being handled by Hyder Consulting and Omrania. The latter is also the site supervisor along with HOK, and Saudi Binladin Group is the main contractor for the project. Sweett Group is responsible for project management, while Omrania, Goettsch Partners and David Wrenn will work on the interiors.